Elvy：Hello everyone! My name is Elvy from WeMerge Capital, today is Christmas Day, Merry Christmas everyone! Today is also the first anniversary of the Newton project, so we have also titled it Grav-Mass Day. 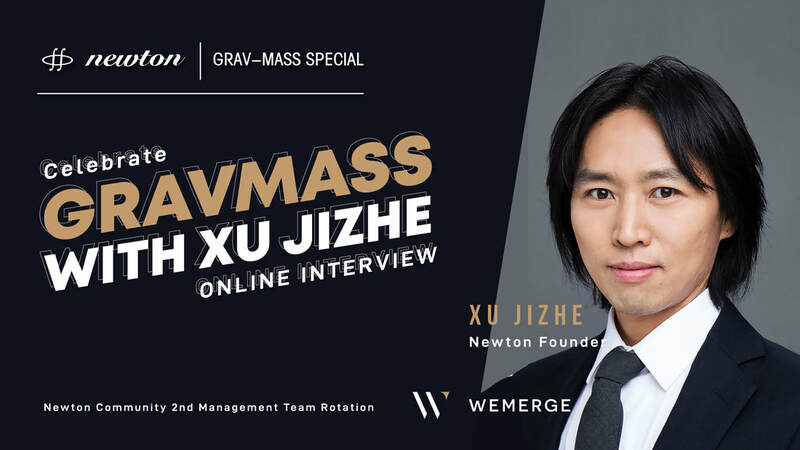 On this special day, we invited Mr. Xu Jizhe to share his feelings on the first anniversary of Newton with us through online live interview. The first question is, what is your special feeling for the first anniversary of Newton? Mr. Xu: My feeling is. . .
What? Am I gaining weight? How is it possible? You didn’t see me, if you meet me, you could not recognize me, I have lost a lot of weight recently. Well, the biggest feeling is that I really want to thank the community for your support of Newton. Newton advocates the community economy, so I have always adhered to the basic principle of community is the priority”. All the policies we have formulated give priority to community benefits. Only when the benefits of the community are guaranteed can the Newton project succeed and continue to develop. Therefore, the biggest feeling, first of all, is that Newton has a very good community. Secondly, the development of Newton's technology is very smooth, followed by the development of commercialization. In short, there are too many things to do. In fact, most of the blockchain projects deliver limited number of products from its founding stage to its operation stage. We promised a lot before, so we have a lot of things to do and we must keep meeting and exchanging. Elvy：Well, ok, can you tell us about Newton’s next step? Mr. Xu: The next plan is to achieve several milestones. First of all, today we started to issue tokens with two steps. The first step is to send you a verification amount of tokens to ensure that you can receive them correctly. In fact, to make sure the accuracy of your address, we will review your address repeatedly when transfer tokens to your address. The process of verification is necessary, if you directly transfer 100 million New to an address but it is wrong, then there is a big problem. So in first step, there is a verification amount. Today, we will send out verifying tokens to more than 100 accounts. Then I will send the left amount to these accounts tomorrow after confirmation. The first milestone is the issuing tokens, it will be done in the next few days. The second milestone is that we will release version 1.0 of Newpay, which is expected to be done around the end of January. With Newpay V1.0, our entire governance functionality will be added here, and there will be a super node mechanism on the network. Then, after Newpay1.0, there will be Newmall, and then, we are going to combine the development of Newpay and Newmall, to expand the size of the entire community, the number of holders of NEW, and then the quantity of transactions on Newchain. These are the main thing to be done in the future. Elvy：Well, I guess one question that people are more curious, and often asked in the community, is when Newton is expected to go to the exchange? Mr. Xu: As for Newton go to the exchange, we have two basic principles. The first one, in fact, we mentioned it at the Macau conference, that is, we will prepare our HEP at the end of February, also called hyper exchange protocol, then once the protocol is open, all DAPPs, including transactions, are free to access to Newton. So this is a major event. From that point of view, once the HEP is open at the end of February, any exchange can be directly accessed. Second, before that, we are communicating with some relatively large-scale exchanges and seeking deep cooperation. This communication will have clear conclusions recently. Because there is no formal contract yet, it is not appropriate to talk about which exchange is determined. It may misguide community members. Therefore, for Newton, there are two parts for opening the exchange mechanism. The first part is free access after open HEP, the second part is that we will talk about cooperation programs with some large-scale exchanges. Elvy：There is also a phenomenon in which most of the communities in the bear market are inactive, no one speaks, except for grabbing red packets, but recently the Newton community is very active. What is the reason? Mr. Xu: This is mainly based on the rotation. It is mainly based on everyone. In fact, the rotation of the Newton community is a concrete manifestation of the basic idea of ​​community governance. That is, Newton is not a so-called project of corporate operation. It shouldn't be that everything should be done by the Newton project team but rather should be done by the Newton community. So, I was thinking about where we should insert this management mechanism, and then choose to insert this management mechanism through the operation of the entire Newton community. The specific way is called rotation management, that is, community members can all be teamed up to manage the Newton community for a week, and we have a complete incentive mechanism for them. From now on, this mechanism runs well, because in fact it will let the whole community participate deeply, and the effect is good. Then we need community talents from all walks of life to join this mechanism. In addition to community operations, such as commercialization, editing, and then operation, we will use similar mechanisms to advance the Newton project. In the end, we aim to create a globalized stereotyped organization with the highest efficiency. Elvy：Well, I am also calling everyone here to join the rotation management plan. Because our WeMerge Capital is the owner of Newton's rotation in the second week, we manage all the communities in Newton during rotation period. This rotation is not only a matter of growing up for us and Newton, but also a very big contribution to Newton. So, I also encourage all friends of Newton’s community to team up actively, or consult some friends who have successfully teamed up, and then go to the next election for rotating group owner. It’s very meaningful, I believe the owners of the first week rotation has gained a lot. So everybody just come and join the election of the rotating group owners! Mr. Xu: Yes, so I also want to take this opportunity to thank the first rotating group leader, the Sunny team, they did pretty good job. Thank you too. More and more teams need to be involved in rotation management and work with the Newton community. Elvy：Yes, all of Newton’s communities are fans of Newton, NewFan, lol. Mr. Xu: Currently in Newton’s so-called official office, there is only one person responsible for community operations, and then we are not planning to recruit a second person. Newton plans to rely on this mechanism to realize operation management of all communities. In all projects, it is rare. By relying on this most powerful mechanism, it is actually a mechanism that (to promote) the deep participation of everyone. We could recruit two people, five people, ten people, or twenty people to manage the community, but it is not right. We only recruit one person, and you are quite familiar with him, Leon. Elvy：Yes, in fact, I admire Newton in this aspect. I found that everyone has a desire to go forward to participate in the rotation management. I don’t know why there is such a big magic. I even joked that we didn’t work that hard for managing our own community. And Newton did not spend money on any activities, promotion, community expansion, so what is the charm of Newton? On this special day, Mr. Xu, will you plan to give us a gift? Mr. Xu: Well, today we will announce the plan for airdrops. It is also a gift from Grav-Mass Day to the entire Newton community. During the entire token exchange process, we received more than 10,000 qualified KYCs from all over the world, but because of the limited amount of token exchange, only some people participated in the token exchange, and most of them did not participate. KYC but did not participate in the token exchange. There will be about 10,000 people, so there will be about 50 million NEW to be issued, but this 50 million is relatively reasonable. At the same time, this 50 million New is distributed to 10,000 people, so it will not constitute the impact of this liquidity. Then, more importantly, we advocate a substantial increase in the number of New holders to stimulate the activity of the entire community. Therefore, we officially announced the news today. From tomorrow afternoon, everyone can fill in their Newpay address in the system. Because of the Christmas, Newpay's IOS version of the online audit was affected, so the collection time of our entire airdrop address is from tomorrow until January 7. The iOS version of NewPay is expected to be approved by the end of December or early January. However, after January 7th, if anyone has not filled the address, it is deemed to be automatically abandoned. The distribution of our entire airdrop will be divided into two batches. The first batch of airdrops was issued on December 31, 2018, as a gift for everyone's New Year. The second batch of NEW will be issued on January 8, 2019. So this is a gift for the community today. The most important purpose is to enable NEW's holders to quickly reach the scale of more than 10,000 people in the initial stage. More importantly, these 10,000 people are completely logical. My team and I also said this is better than distributing candy, which is not logical. For example, if I give a candy to a person, I don't need him to pay back. Then he does not need to give me feedback. However, this is actually a kind of feedback, it is a kind of gratitude. Because all of these KYC users, they all like the Newton project, otherwise he will not fill in the KYC information. Through KYC, they are users with perfect data. It is because the exchange amount is limited and it is not able to allow everybody to participate in token exchange. So, from this perspective, with a reasonable cost of 50 million New, the entire Newton community New holders will increase to 10,000 people, I think this will be crucial for the later development of the project. Elvy：Well, I would like to emphasize that those who have passed KYC but have not received the token exchange quota, you will get the airdrop NEW to give back to your support for Newton. Mr. Xu: Yes, feedback, thank you very much for filling out the KYC information, and thank you very much for your support of the Newton. Elvy: Then, I want to ask a few questions that everyone is very concerned about. Mr. Xu: Ok, then I will answer one of the questions on the screen first. Some friends asked, does the person who engaged in token exchange will not get the airdrop NEW? Yes, the person who gets the quota has no airdrops. The airdrop is only for those who participate in KYC but do not get the token exchange quota. Elvy: My question is about Newmall: For those who are in the service industry, there is no physical store, is it also suitable to open an online store in Newmall and benefit from the decentralized system of Newton? Mr. Xu: Well, it is suitable for the service industry, or you are selling virtual products, even if you are selling algorithms, um, you can settle in Newmall, because Newmall is a very common trading platform. It is ok, but there will be a gradual process. The first batch is that we will filter the merchants relatively strictly in order to ensure the quality of the service. This is controllable for the user experience, otherwise the user experience is not good, everyone will feel that this product will have problems, which in turn will affect the entire Newton system. So in the future, we will devolve the entire Newmall check-in process, review mechanism, and distribute this power into the network, and drop it into the super nodes of this business type, and let them decide which merchants will settle in. This is a relatively deep problem, including our rotation management system. That is, the current rotation management system is actually the most primitive stage with no blockchain. What will happen in the future? In the future, the super nodes of our entire system will probably be perfected to about 100 nodes. At this time, the nodes are divided into several types. For example, for a certain type, he is called the Newton community node, that is, the community operation node, we may choose to have ten in the world, then, this time the automatic community operation is here. 10 of them automatically flow, then if you want to participate in the entire automatic flow, you will first run for the super node. Then you choose, you will automatically manage this community, and then your income, in addition to this 60% of this mining income, the foundation itself can hold this token. In the future, all of this is going to work, so what is the core issue here? The core issue of the blockchain? When I interviewed by Mars Finance Editor Li two days ago, I said anyone who goes to talk about this token economic model design is a layman, because the core of the token is not the economic model, but to put the centralized power of some kind of governance back down to the decentralized network. However, in delegating power to the Internet, it has a premise that you have to do something so meaningful, otherwise there will be no decentralization of this so-called governance right. Therefore, for most blockchain projects, if it is in the air state, its nodes have nothing to do but bookkeeping. And Newton is a large commercial network. We rely on retail to start this commercial network. At this time, in fact, we will give the authority of this commercial network to the nodes. For example, if we want to open an online store on Alibaba, then whether the online store can be approved is determined by Alibaba’s certain department. What is the core of the future? For example, Newmall has a business, can it settle in? It will be determined by the node of this type of commercial operation. For example, there are 60 business type nodes in the world, so the merchants need to get their vote to open the store on Newmall. Another type might be the nodes of the arbitration. For example, if you have too many complaints about a store, the nodes of the arbitration will also vote once, and the result of the vote may close the store. Probably this is a logic. It is also the logic of a systematic operation of the future Newton super node. Under this logic, the function is definitely to support a variety of service industries, virtual goods, and even unique types of tokens can be traded, we can design. For example, you can send a personal token, this is when you send me a hundred tokens, then this hundred tokens can sell your time, then this time your token can also be sold on Newmall, of course, I will definitely want to buy 90, and then I can sell this to someone who needs you, otherwise he will have no time to date you, lol. Yes, in fact, Newmall is, to some extent, an exchange that does not have a trading limit. We can trade a lot of things, and everyone will feel it in the future. Elvy：I just heard Xu said, the community can do a lot of things in the future. Mr. Xu: Yes, there are so many. In fact, when we launched token exchange, I said that I really hope everyone can participate in this. The only way for everyone to profit from other blockchain projects is to buy tokens as early as they can, and then sell it in the future, and they have nothing to do with this project, then people go find next chance. Most of the time, you don't even have a chance to sell. Well, I hope everyone in Newton have way to participate in the project, first, we are all NEW holders, then, you hold and lock NEW and become our super node, and then you will continue to generate revenue through the operation of the participating network, then the income can be either normal currency or NEW. These generated benefits can cover your costs. In this case, that is, you will continue to gain income by participating in a project and turning it into a startup platform. Elvy：For consumers, whether Newmall has a system that can be directly converted into legal currency. Mr. Xu: Not yet. In fact, this is a license issue. If an app receives both the cryptocurrency and the legal currency, it requires a legal currency channel. Obviously, there is no such law in China. Well, we will look for it overseas, but now we have not taken this as a priority. Elvy: So what do we expect from Newmall's trading volume next year? Then how much will it return to NEW's purchaser? Mr. Xu: Well, we have always said that we hope to achieve the scale of 3 billion yuan of transactions, which was mentioned in the Macau conference. Then, we have some channels that can greatly increase the transaction volume, such as wholesale channels, but in fact it is not a very good transaction performance. In fact, we prefer to make the retail transaction amount, but from now on, 3 billion should be a number that can be expected. But the whole pressure is really big. As for how many buyers will be assigned to NEW, it is actually related to this New release model. Our release model is deterministic. On the first day of the year, there will be 2.1 million NEW, then the whole is based on the NEW force to divide the money. We also spoke at the Macau conference, in fact, the purchasing power of a renminbi is equal to this New Force. You can count how much NEW is based on this. From this point of view, this is a game process. Just like this mining, when everyone is mining, the difficulty of mining will increase, but at this time, if your equipment is not upgraded, It is equivalent to the amount of coins you have dug, but the price of the currency may rise, and you will increase the amount of money you earn. Therefore, according to this New distribution mechanism, I have always adhered to two principles. The first one is NEW 's issuance. Certainty will produce expectations and prosperity. The second is that there will be scarcity. Otherwise, this liquidity will be rampant. Then, under the principle of determining a scarcity, everyone will go to the money here according to New force. So when we were at the Macau conference, we said that if we had only one person a day and spent ten dollars to buy a pair of socks, then he would get ten new forces. He will come up with a 100% token. That is, a person may hold 2 million of this NEW. When the news appeared, it might be detonated the next day, which is unlikely. This New will increase, meaning NEW’s liquidity will increase. Then as NEW 's usage scene increases, so the process of this game will make the whole thing work. Elvy：Will the NEW holder get the dividends? Mr. Xu: Actually, this is a very basic issue. By the way, I also explained why should the NEW did not participate in the exchanges was destroyed. Newton's token is divided into two parts, one part is equivalent to the so-called mining and the other is non-mining, including foundation, team, and participation in the token exchange. Then, the 60% of mining is actually issued by mechanism. Just now, the core issue of token is not the economic model design. Token is the carrier of certain rights, then the centralization power is decentralized to the network. Because you have the right to participate in or operate a certain huge business network, you will get the corresponding benefits, so the economy is a result, not a cause. Because you hold this so-called token, you can get this benefit. The issuance of tokens is not possible in itself and should not have interest. Let me give you an exaggerated example. For example, it is impossible to define what you can earn in the constitution of our country or the US constitution, because in the design of the most basic level of an organization, it has nothing to do with money. One thing that defines is some kind of right that you should or should have. On this basis, there will be commercial activities, such as opening a bank, or you can open an insurance. In this insurance, you can actually talk about it, or in the bank you deposit money. The token issue in the white paper is equivalent to a constitutional level. It will not have this so-called economic model or the concept of so-called interest. If there is, there will be problems. 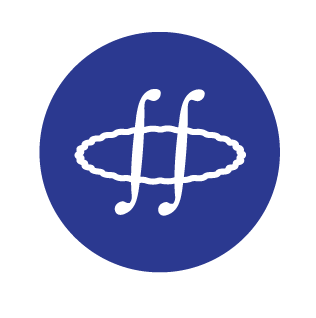 So, everyone can see, Newton's whitepaper, we are talking about the token model design has never said, deliberately avoid the token economy, because this is not an economic problem in itself. So, based on this principle, we have about 1.1 billion New in the third round, and we have not exchanged with the community. Because we caught up with bear market of Bitcoin, we ended up. Then at this time, there are only a few ways to deal with these NEW. For some project team, they may take these tokens by themselves, which is a terrible decision. Of course, for us, this option will never happen. Because this option does not meet the principle of community priority. For us, the first way is to move these NEWs to 60%, but this is contrary to the spirit of the white paper, which is equivalent to cross-border misappropriation. It is unreasonable from participation to mining, so this option is denied. The second option is to send the interest that these NEWs become locked to the community. But the applicant for this project will have the concept of interest in the basic level of design. In addition, many foreign large-scale transactions with all the token mechanisms will be judged that the token has this securities property. So this solution is not suitable. We finally decided to transfer it to the address of a black hole and always publicize it on the blockchain. Let everyone know some of the logical practices of our project in the initial stage. The 1.1 billion New is like a certain sea god needle, and it will always exist in our blockchain and become a very important proof of our credit. Elvy：Can you give me some more time? There are still problems. Mr. Xu: Ok, yes, I think this way is quite good. In fact, this is a very efficient way of interacting with the community. ELVY: A lot of people are asking me how to become a NewMall merchant? Mr. Xu: Well, the first batch of merchants we settled in is indeed our initiative. For example, OKbuy, Li Shubin is responsible for this. In this regard, he is an expert and his resources in the industry are also very rich. Later, in fact, I think this is where we are not doing well, that is, we do not provide a clear process for everyone. We already prepared to organize a process on how to settle in Newmall. In this process, we will explain how you should submit relevant information. Initially, the Newton team is reviewing. The next step will be handed over to the corresponding super nodes for review. I will arrange a timetable first, and strive to show a clear process of entering the Newmall before the Spring Festival, that is, in January. Elvy: Why is it called Newton? Mr. Xu: This actually explains it many times. Newton is a great scientist, but in his later years, he is the director of the Royal Mint. And this experience is actually unknown by people. During the term of the director, he also made two important financial innovations and contributions. The first is the anti-counterfeiting technology of this serrated edge of the coin he invented. The second is that Newton actually invented the modern gold standard system and replaced the original silver standard. Therefore, in order to commemorate the huge contributions of Newton in financial, we chose to use Newton to name our project to pay a tribute to Sir Newton. In fact, Newton is very interesting, he is not a particularly serious person. Newton also engaged in trading stocks. When there was a stock at that time, Newton was also a pioneer. He went to speculate on the stock. The result showed that if the money converted the current dollar, he lost $3 million. This is a lot of money for him. Therefore, we believe that if he can live in modern times, he will definitely buy Bitcoin, and he will lose money with a high probability. Therefore, if you lose money, you don’t have to worry, big scientist Newton was also in a mess. The second speculation is that Newton will certainly understand the fact that the blockchain is the future of the 21st century, so he will definitely issue tokens by himself. Therefore, we are now also fulfilling a wish for Newton's elderly, so from this moment onward, Newton is not only a unit of natural force, but also a unit of digital asset. Elvy：This sentence is very classic, we will send this sentence to the community later. Mr. Xu: Yes, this sentence was written in the first transaction record of Newchain. This is what I wrote. I asked a friend of mine, Professor Gu, to help translate the English. Elvy: It’s actually near the end of the live broadcast. What else do you want to share with us? Mr. Xu: First, practitioners in the field of cryptocurrency industry include several types of people. One is a senior practitioner who has experienced many cycle-periods. They have seen a super bull market since 2017 and experienced sharp wealth increase and decrease in a short period, like a roller coaster. There are also some people who have just entered the industry and have heard many exciting stories. But what I want to say is that I think the current blockchain is normal. Last year's blockchain, that is, explosive growth, and then rapid decline, is not normal in itself, but now it is normal. From the perspective of the nature of business, from the essence of entrepreneurship, Sequoia Capital has invested in one hundred projects after careful screening, but what can be so-called success is very, very few. We said that throughout the business of entrepreneurship, failure is normal, and success is not normal. For the blockchain, no matter what the project is, in fact, the difficulty of starting a blockchain project is far greater than the traditional commercial company, so for me, Newton is a very serious entrepreneurial project, not a simple one for a speculative project. This is my judgment on this industry. That is to say, the whole logic of this whole market in 2019 years will be completely different from that in 2017 and 2018. Like the fate of destiny, I did not expect that we will send NEW to everyone on December 25th, but it also marks the public circulation of Newton in the market, so first of all, I wish you all Merry Grav-Mass, and then wish everyone a happy new year. I especially hope that everyone's mentality in the new year is really positive for the development of Newton, take it as our common entrepreneurial project. It is an opportunity to realize our common ideals. Everyone is the holder of NEW. I hope everyone can be actively participate in the election or voting of the super node. Then, I hope that the super node can really take up the work of community governance. The third hope is that all of us will work together to create a global network of huge business. The final result must be that everyone benefits, so that NEW's value is added and supported. By then, we will have very good rewards. We say that Newton is a dazzling giant to work overtime, because we are going to create value. Elvy: Thank you, Mr. Xu, thank you! Mr. Xu: I think we have a very good interaction. This is a very simple and efficient way. Elvy: Everyone, please remembers to go to the HUOBI.com to support us.